Motorola is the defacto standard for cable company set-top boxes. Nearly every provider uses Moto boxes and software. This installs hope that the accessories Motorola announced today at IBC 2010 in Amsterdam actually have a chance at making it into the average consumer’s life. So there you have it. Motorola’s QWERTY solution and seeing how Motorola also codes the software for a lot of the set-top boxes out there, this remote has a shot of hitting the mainstream as part of a larger IPTV roll-out. It’s no secret that Internet content is part of TVs future, but the vast majority of consumers aren’t going to jump on board with products like Google TV and the others when their Comcast box currently works. 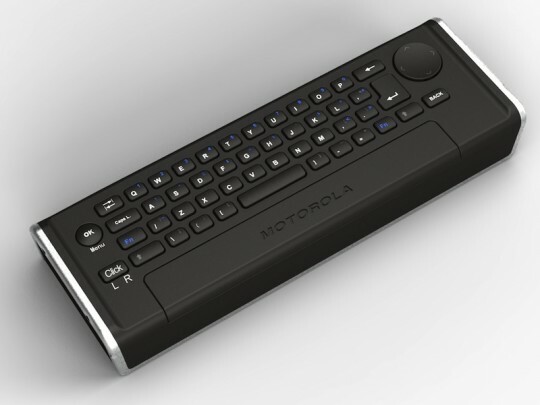 However, perhaps this remote is a sign that Motorola is working on new set-top box software that actually needs QWERTY input and could hit your provider in the short term. The remote is actually part of a five-model lineup that includes new fast-recharge capabilities that uses super capacitors capable of holding a two week charge off of only 60 seconds of USB power. The rest of the models are just your standard boring candybar remotes.